It was about time I learned how to make this. I’ve eaten dumplings so much but never tried to make it myself. Knowing myself, how I complain that I don’t get enough for the prices here and how I tebd to cook more to suffice for the next day, I was happy to challenge myself. As you can see from the inconsistent folding/pinching I did to seal these dumplings that I made it myself and to my luck none of them opened or broke while steaming. I filled it with a mix of pork, shrimp and spring onions seasoned with salt and pepper. 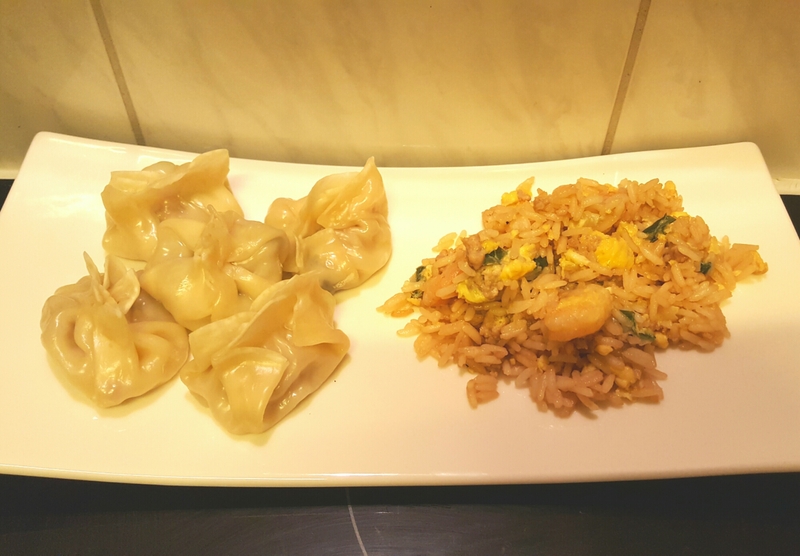 Since I ran out of dumpling wraps, I used the rest for the fried rice since you can make any kind of fried rice you want at any given time or opportunity. This dish was a hit! And so easy to make at home although time was invested because I was so worried they weren’t sealed properly. Nevertheless, I have now embarked on another Asian Food Challenge journey and I’m off to look for my next conquest. Tip: If you’re using a rice cooker (a prominent fixture in any asian household) that can be used for steaming as well, spread a thin layer of olive oil onto the steam bowl to keep the dumplings from sticking to it while its cooking.